Not terribly common these days, but, they still make them. As he would shave, I'd lather up my face with the shaving cream, and he'd hand me a spare razor -- without the actual blade -- and as he'd scrape away his beard, I'd essentially scoop the shaving cream off my own face. I suppose in many ways that is how I learned to shave. A decade too early, but, the gestures, motions, facial contortions, all observed, mimicked, and repeated. Eventually the time arrived for my own facial hair to be dealt with. I don't remember exactly how old I was, I don't actually recall the first time I shaved "in earnest" -- but it was the beginning of a process that will likely go on for the rest of my life. Anyway, for Christmas 2012, Nicole has gifted me a spectacular shaving set which comes complete with some key ingredients to make this daily ritual of mine a bit more pleasant. Yes, I said daily. I know a lot of men don't shave every day, but my beard grows pretty quickly, and a day without looks pretty bad. Indeed, there has only been one time in my life when I did not shave daily: Chicken pox at the age of 18. Yeah, that kinda sucked. The doctor suggested I not shave for a week or two (ya think?!) until the skin issues cleared up. So other than that one week, decades ago, every single day some sort of metal scrapes my skin. This was actually a Christmas gift from Nicole last year. Hmm. I'm starting to wonder if she's conveying some sort of message about my facial hair....anyway, moving on. The Panasonic LV-81 is the best electric razor I've ever owned. It can be used wet, or dry, and delivers a phenomenal shave. It does need to be cleaned pretty regularly, but the cleaning system it comes with takes care of that nicely. Of course, how often you need to clean it probably depends upon your beard growth rate, and the type of hair you have. Ah, right, the daily ritual and the gift. Every week or two I would take the time on a Saturday morning to do a proper wet shave with the Panasonic. I've tried various creams and gels, and they all work moderately well. It's a much slower and messier process, so it's not something for every day. I should mention that I've had a goatee for the last 15 or so years. Ever since a colleague said to me that the only thing that would make me more sinister would be my having one. Thanks Pete! The goatee matters as it does add to shaving time, as well as some of the nuances of the process. 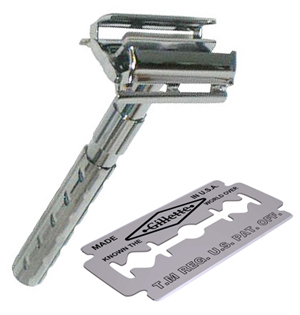 There's a no-go area for razors, and being very careful with your "edging" is essential. There have been a few times where I trimmed a bit too far and things became uneven, but mostly this isn't a problem when using an electric razor. A manly box for manly men. Ta-da! 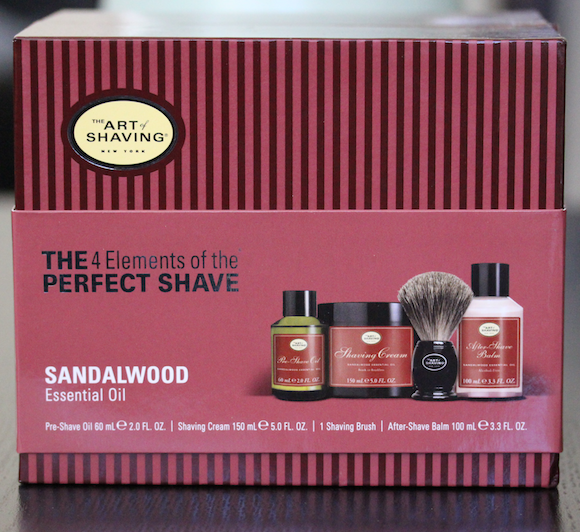 The "Art of Shaving" Sandalwood shaving elements set! The box itself is large, square, robust, and is clearly meant to convey a sense of manliness. You won't see a set like this distributed in a pink chiffon bag. And if you do, you're in the wrong shop. Nicole picked this gift up on her travels to the United States a few weeks back, so I don't actually know much about the shop it came from. Nor do I know the price, but I shouldn't do, as it was a gift. You can visit their online store, though, for more information. Pre-Shave Oil. Sandalwood essential oil. Shaving Cream. Sandalwood essential oil, to be used with a brush, or brushless. 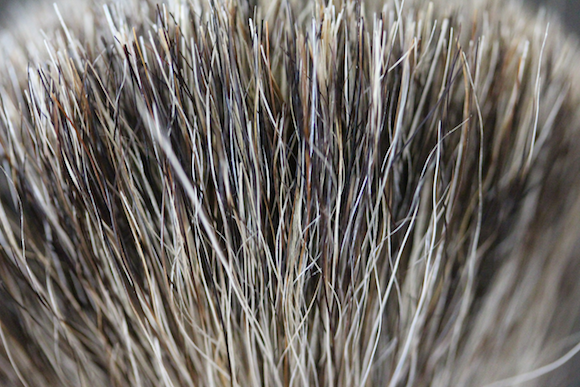 The pure badger hair shaving brush. After-shave balm, also sandalwood, but, crucially, alcohol free. Convenient holder for the badger brush. Now, if you read carefully, you'll see that under the first section they suggest that for best results you should shave after or during a hot shower. I can honestly say, I don't think that I've ever done that in my life. I've heard this is the right way to do things, read it on boxes such as this (and, let's face it, if someone has printed it on a box, it must be true), but not once that I can recall have I ever showered first and then shaved. I may have to try this approach with this kit, but, given how messy the process of wet-shaving is, I really like having the shower after to get rid of any lingering shaving cream, from wherever it may have travelled. 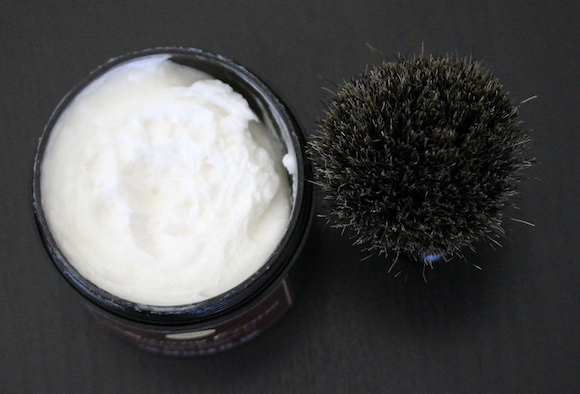 The badger hair brush is absolutely fantastic when paired with the shaving cream. You really don't need much of the cream, it goes a long way. I moisten up the bristles in hot water, then just barely dip into the shaving cream. Badger, badger, badger, eek, a snake! It really is a remarkable lathering experience it creates, and with much more precision than you may think a big bristly brush would provide. If you haven't shaved this way, you should give it a go. I'd done so once before, many years ago, but after a series of moves around the planet, I lost the kit and ended up sticking with just the wet/dry electric razor. I mentioned that the after-shave balm crucially contained no alcohol. If you've never experienced a really close shave, you may not know why this matters, but, with this kit, you may well find out. Sometimes this process can exfoliate your skin in such a way that it's a bit raw, exposed, and the application of a cologne or after-shave which has alcohol will make your toes curl. Put bluntly: It hurts. Every now and again after a wet-shave when things were particularly sensitive, I've regretted spraying on my Allure or Code, as, inevitably, some of the drops make it to a bit of neck/skin which immediately made me wince in mild pain. The after-shave balm does have one gotcha though: The dispenser seems to be a supersonic velocity pumping mechanism. The tiniest of presses results in a high speed spurt. If you're not paying attention, it will splatter...just keep that in mind when you're trying it out. Anyway, that's the set. It's fantastic. I used it several days in a row over Christmas, and look forward to using it again soon. Without a doubt, it's resulted in the closest shave I've had in years, and I'm extremely happy with this thoughtful gift!